When I first started knitting I was obsessed with sock knitting. I was also obsessed with stashing sock yarn. I would seek out interesting handpaints and for me my palette was the brighter the better! My LYS knew of my obsession and would call me when they got a new shipment of sock yarn. I was one of the few that could get first dibs on colorways. Over the last couple years my tastes have moved toward mixes of earth tones that remind me of Fall, my favorite season. I also melt over rich tonal paints of blues, greens and funky rusts and golds. 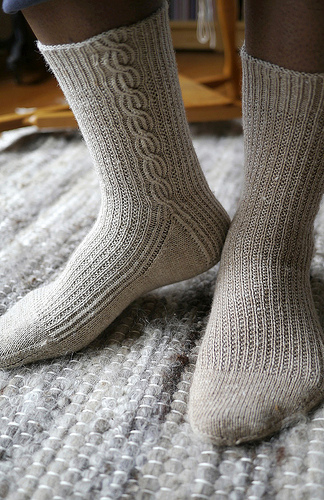 Of course I still knit fun variegateds once in awhile, like my Shalimar Zoe socks above. I often wondered why people got so excited about natural colored yarn. What would possess them to buy yarn the color of the animal it came from? Would their heart really flutter when they saw a skein of white or brown yarn? And then I started working for Anne. It was February and she had just sent out her first chapter of Bare Naked Knitspot (BNK). I couldn’t wrap my mind around a club of natural yarn. I’d been in clubs for years and for me it was all about the handpaints. Heck! I was even a member of the first Fall In Full Color (FIFC). 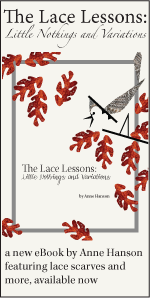 My viewpoint changed when I sat down with Anne and she shared her passion for natural yarn. I was enthralled with her explanations of where fiber came from and why certain fibers were suitable for specific projects. This club was brilliant. Then she showed me the baby blanket from the first chapter. Sky Ladder took my breath away. 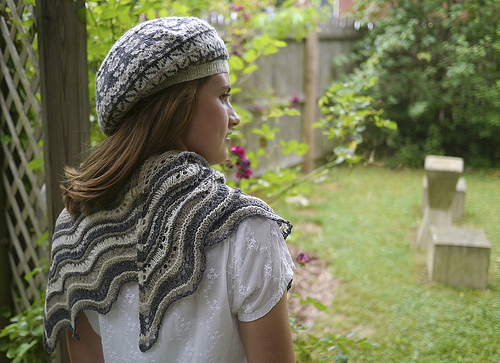 The stitch pattern…the color of the yarn…the texture of the yarn…amazing. I even got a little teary. I say it was because the piece was so beautiful. Anne says it was because I was two months pregnant. It may have been a combination of the two. I called my mom that night and said, “you’ve got to sign up for this club!” Though it was hard, I didn’t give her one spoiler. I wanted her to be surprised with every shipment. And she was. She loved that each month the club yarn came first; an unassuming priority mail package. Inside was a a simple brown bag with a club logo sticker. The package, in its simplicity, kept the focus on the contents. She would spend days looking at the yarn, wondering what its future would hold. On the 17th of each month, she received a notification email from Mr. Knitspot. The pattern had arrived! Encompassed in a 30-40 page ebook chapter, no less. My dad would lovingly print each and every page of the e-book chapters and she would pour over them. She would labor over what to knit because Anne often includes several variations to the pattern, whether it’s different sizes or companion pieces, such as Apples in Clover Tam and Sheltie Triangle. My mom loved the club more with every shipment, down to the packaging it came in. In fact, she keeps each yarn in its brown paper bag until she knits them. The club didn’t just cover animal fibers. 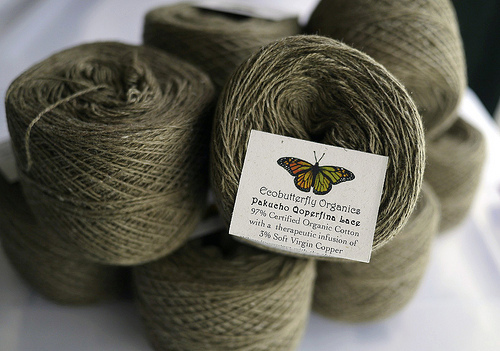 Anne worked with Ecobutterfly Organics to offer members color grown cotton. Yes, that’s right. Color gown. And of course Anne was able to get her hands on the most coveted color – green. How can you not fall in love with the awesomeness of this natural yarn? Anne is passionate about how yarn is made. She even worked with a mill to develop her own sock yarn, exclusive to club members. a unisex sock design that club members were wild for! I have a particular fondness for this yarn, probably because Anne and David invited me to join them in East Jordan, Michigan, on a tour of the mill. It was on this trip that I saw how Anne went the extra mile for members, giving them an inside look into how a yarn is made. While I jotted down notes during the tour, David filmed the tour and trudged through the snow to get great photos of the farm. I also had the opportunity to help Anne research the history of the fibers for each chapter. I was tickled to be part of this level of the e-book, watching facts turn into an amazing story spun by Anne. And then of course seeing Anne’s design process – swatches coming to life in a hand knit piece and photographed so beautifully by David. My mom was so inspired by the pages of the February chapter that she cast on the Sky Ladder baby blanket immediately. She loved the pattern so much she offered to make me the wrap if I would give her my club yarn. She thought they would be very special heirloom pieces for Baby Knitspot’s christening. I was ecstatic. I desperately wanted to make the shawl, but knew I wouldn’t get it done in time. When she finished all the pieces she called and said, “I don’t want to gloat, but this is the most beautiful thing I’ve ever knit. I’m so proud of myself.” I was so excited for her. Isn’t that the best feeling? The Sky Ladder pieces were my mom’s first Knitspot knit. She was hooked. She has not stopped buying knitspot designs and she’s also a member of FIFC. 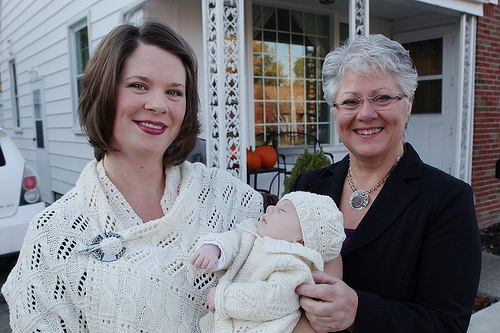 Baby Knitspot and I wore all our handknit pieces for his christening. Anne even knit Padraig a sweater to match! Don’t these pieces shine because of the natural wool color? At the luncheon following, everyone was talking about how gorgeous we looked in our knits. Many were moved to tears when they found out they were handknit. And to think…all of this was possible because of Anne’s inspiring ebook chapter and yarn pairing. 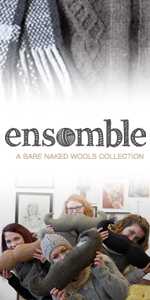 The 2012 club e-book turned out to be a 200-some page book, covering six fibers from around the globe. I’m blessed to own a copy. Before the club finished, Anne knew she had to do another BNK. There were so many more fibers to explore! The last few months I’ve helped Anne plan the club. It’s been amazing to watch someone’s vision come to fruition. And I can’t believe signups begin Nov 23! BNK 2013 is a six month exclusive club exploring yarns in their natural state. Shipments begin in February and there are a limited number of memberships available. Please join me, and the other members of the swingin’ ravelry clubhouse, in celebrating yarn in the colors it was born to be. If you need a little more convincing, watch the BNK 2012 slideshow on flickr here. An in-depth explanation of club details are available here, so eloquently put by David. Due to finances I haven’t been able to sign up for the previous clubs but this time I am not letting it pass me by. I’ve been looking forward to this to come around again since the first one when I promised myself I would make it happen. I’m so. bloody. excited. Thank you for sharing some behind-the-scenes info; it makes the club extra inspiring. You pictures (and knits of course!) are so beautiful. I’ll be in for pattern only like usual, can’t wait to see what’s in store! Ive been praying for another BNK club. Thank you, Knitspots. It was a brilliant club. But then so is FIFC. The Sky Ladder pattern and yarn were my favorites from the club. 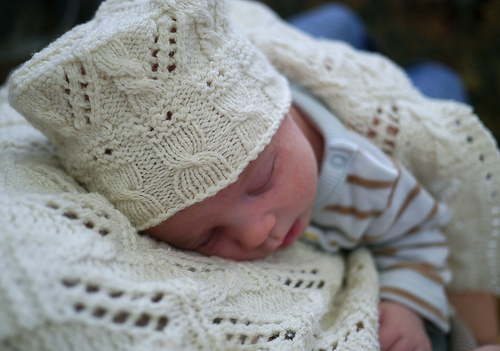 I knit myself a petite wrap and I just gave a baby blanket and hat to a pregnant friend. She was overwhelmed. Looking foward to the next club! How beautiful is that child! And the photo work – as always for this blog – is just lovely. Beautiful post majordomo” and I can’t wait for Nov 23 to be able to be “in the club”. Woo-Hoo!! Gorgeous knits and wonderful post, love this club, was a member last year and will be a member this year too. I know exactly what you mean about changing tastes. When I first got back into knitting, it was the bright colours of Noro yarn that lured me back!! My stash from that time reflects this. Now I am drawn much more to semi solid or solid colours, although I am still not a huge fan of the neutrals. I like me a bit of colour!! Looking forward to the club, I will be pattern only again as I have far too much stash needing to be used. I am now enthralled by this club. I will sign up immediately upon becoming available. I’ve loved color deeply and am sure I will continue to do so, but lately have been drawn more and more to the more natural colors in a back to earth authentic kind of way. The realization of my being drawn to this new phase in my life, the timing of your wonderful post, and the opening of the club for 2013, are a sign to me that I’m on the right track. Cannot. Wait. To. Sign. Up. I really enjoyed all the different fibers and fantastic from BNK last fall!